Toshiba UK today announces the new Toshiba Chromebook – the first 33.8 cm (13.3”) Chromebook4, for users wanting the convenience of storing data in the cloud, with the freedom to access it anywhere3. Built for work and play, this smart device packs speed, performance and style into a travel-friendly size. Equipped with essential web and connectivity options, Toshiba Chromebook was made for work and play. The versatile 33.8 cm (13.3”) HD display offers plenty of screen space for web browsing, apps or work documents - particularly it is also compatible with familiar formats. It also comes with up to 91 hours battery life and a performance that begins with a fast start-up. Add to that the power of the Intel® Celeron processor, and users can get straight to being productive or staying entertained, all day long. Toshiba Chromebook allows users to store data in the cloud, which opens up where and when content can be used. With Wi-Fi® connectivity and 100 GB of free cloud storage2 via the built-in Google Drive, data is always backed up and can quickly be saved online – for easier access from anywhere, at any time. Information can be synced in the cloud too, for sharing to other devices. This allows content to become more moveable and manageable, so if a Google Doc is edited on Toshiba Chromebook, it can also be viewed on a PC, tablet or smartphone – whether the user is at home or on the move3. The first Toshiba Chromebook is perfectly balanced for portability and comfort over longer periods. Yet it’s also effortlessly cool - featuring a slim, clean and modern clamshell design that was made to move. This durable, affordably priced laptop is also incredibly light at just 1.5 kg, making it the perfect size and weight to take anywhere. The device boots up and comes back to life in seconds, so users can access the familiar Chrome browser more quickly. With fast page loads, quick syncing, and hundreds of thousands of Google apps available in the Chrome Web Store, a whole world of content is just waiting to be discovered. Some of the most popular Google apps are built into the Toshiba Chromebook too, so they’re always just a click away - whether users want to visit YouTube or Google+ Hangouts online2. It’s also easy to edit a Gmail or Google Doc, even when there’s no internet connection available. Documents can be created with ease using the full-size keyboard and large screen, while excellent audio and a HD webcam makes socialising more fun when the work is done. There’s no need to worry about updating the Chrome OS or security software on this device. Once connected, Toshiba Chromebook takes care of itself through automatic upgrades. Not only does this provide the very latest information and protection, it also means that minimal effort is required to get complete peace of mind, and keep users’ Chromebook working at its best. 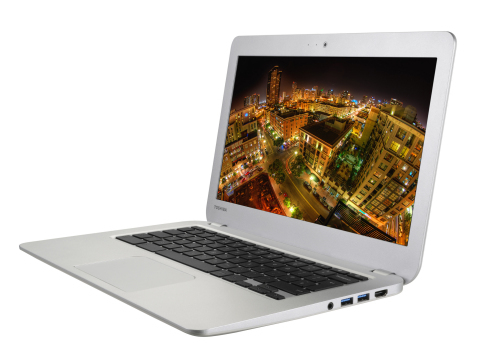 The Toshiba Chromebook will be available in Europe during the first quarter of 2014. Toshiba Group brings innovation and imagination to a wide range of businesses: digital products, including LCD TVs, notebook PCs, retail solutions and MFPs; electronic devices, including semiconductors, storage products and materials; industrial and social infrastructure systems, including power generation systems, smart community solutions, medical systems and escalators & elevators; and home appliances. Toshiba Information Systems UK Limited is a fully owned subsidiary of Toshiba Corporation, Tokyo.